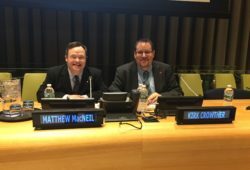 The Canadian Down Syndrome Society is a registered Canadian charity that accepts donations to fuel its efforts to progress advocacy and education on behalf of people with Down syndrome and their families (Canada Customs and Revenue Agency Business Number 11883 0751 RR 0001). There are many ways to donate to CDSS and help people with Down syndrome. Choose your method and start donating today! 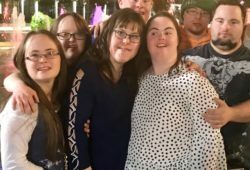 What better way to “See The Ability” than to honour a loved one or recognize a special occasion by making a difference for Canadians with Down syndrome? Tribute donations make great teacher appreciation gifts. To donate in honour of someone, you can contact us or select “In honour of” when you fill in the form below. You will receive a tax receipt for your generous gift. CDSS will acknowledge your gift by sending your recipient an e-card or mailed card with your personal message. A memorial gift is a wonderful way to honour life and express sympathy. Remember someone you love by making a donation in his or her memory to the Canadian Down Syndrome Society. You will contribute to an important cause and help Canadians See The Ability. You will receive a tax receipt for your generous support, and CDSS will acknowledge your thoughtful gift by sending a card or an e-card with your personal message to the bereaved family or recipient of your choice. To donate in memory of someone, contact us or select “In memory of” when you fill in the form below. Monthly donations provide consistent financial support to the Canadian Down Syndrome Society, reducing our administrative costs, and giving your donation further impact and reach in supporting Canadians with Down syndrome and their families. Through our pre-authorized giving program, you can pledge your support on a monthly basis, receive a valuable tax receipt and incorporate your charitable giving into your monthly financial plan. To arrange a monthly donation to CDSS, you can select it on the online donation form below, or you can set it up over the phone. Please call our office at 1-800-883-5608 or 403-270-8500 and a CDSS staff member would be happy to assist you. The below online form is hosted on a secure website and embedded on the cdss.ca domain. If you would like to access this secure form directly click here or the red button below. If you would like a printable donation from to fill out and mail in, download the PDF form or request one at info@cdss.ca. Thank you so much for making your community a better place for Canadians with Down syndrome!